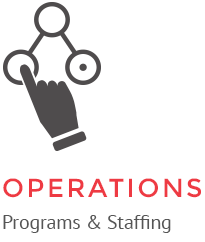 Building the right operational and staffing plan involves more than creating organizational charts. VIVA can help organizations determine the operating models best suited to their goals to create structures that support growth and help your staff find success. In 2015, Chinatown Community Development Center (CCDC) of San Francisco was selected to rehabilitate, own and manage 576 units of the San Francisco Housing Authority’s public housing portfolio. The new units brought the CCDC’s managed portfolio to over 2,200 units of affordable and supported housing for individuals, families and seniors in 25 properties throughout San Francisco’s Chinatown, North Beach and Tenderloin neighborhoods. When CCDC gave VIVA a call in mid-2017, temporary relocation and construction activities were well underway on the housing authority units, another 250 units of family and senior housing were in the pipeline and opportunities were on the rise to be a third-party manager of some smaller Chinatown properties. VIVA’s work with CCDC stretches back to 2005; over the years, VIVA has worked with the organization on multiple property management and asset management assessments and operations plans. Today, VIVA, a trusted and valued advisor, is working closely with CCDC to position the property and asset management divisions to handle this rapid growth. This work includes providing guidance to CCDC as it updates the most recent property management operations plan, builds staff capacity to handle its expanding portfolio, and evaluates the pros and cons of undertaking a more intentional third-party property management line of business. Part of VIVA’s work this time around is a scheduled monthly coaching call with the Director of Property Management on a work plan designed to align CCDC’s programmatic initiatives and staffing with its growth.